The measurement of pH in the presence of hydrofluoric acid can be very challenging. Hydrofluoric acid (HF) is used in processes to etch glass and will quickly destroy conventional glass pH electrodes. The presence of hydrofluoric acid is affected by the pH. When the pH is high, nearly all the fluoride ion will be present as a non-corrosive free fluoride (F-). Lower pH values will convert the free fluoride to HF and present a more corrosive solution to measure. 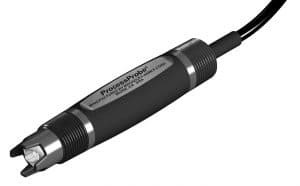 Keeping the pH high will prolong the life of a pH measurement electrode, however an HF resistant pH sensor would be the ideal solution. Hydrofluoric acid (HF) is used in semiconductor processing, glass etching and other industrial processes. The extremely corrosive and toxic nature of HF makes it difficult to handle, requiring special materials of construction. This is also true of the pH sensors needed for its measurement. When they are spent rinse waters and the etch baths containing HF, must be treated before discharge or reclaimation. The measurement of pH to control the neutralization is complicated by the corrosive nature of acidic fluoride solutions. Hydroflouric acid dissolves the glass membrane of most pH sensors considerably shortening their operating life. The rate of corrosion is dependent on fluoride concentration, pH and temperature as well as the glass composition of the pH sensor. Broadley-James has introduced a new pH glass bulb formulation named TX4, that enables the HF resistant pH sensor to operate in the presence of up to 1% concentration HF. Ideal for semi-conductor, glass etching, electroplating and wastewater applications containing HF, the TX4, HF resistant glass is now available in both the S400 and SP200 ProcessProbe industrial pH sensor ranges. Providing a proven industrial style pH sensor design with the advantages of HF resistant pH sensor operation.